You get a ton of veggies and herbs, plus lime! Vietnam is a less-developed Southeast Asian country, but also a popular destination for many. It is a country that takes some getting used to if you have never been before, and that was certainly true for me. Despite the fact that I had travelled to many Southeast Asia countries, I still got a little culture shocked in Vietnam. 3.2 Stick to the Meter! Vietnam Dong is a weak currency, and most hostels, hotels, and tour companies will accept payment in USD. The prices are usually fixed, and even though the exchange rate won’t be stellar, it’s better than having too much Dong on hand or getting mixed up about the currency (I know I did). The same can’t be said for smaller transactions. Many backpackers buy a motorcycle and drive around Vietnam. But unless you are a) fearless, or b) a pro driver, I won’t recommend it. The traffic in Vietnam is manic and extremely chaotic. A nation of motorcyclists, the roads are crawling with them and more often than not the traffic rules are completely disregarded. Foot traffic, believe it or not, is an integral part of the road hierarchy. Despite the fact that traffic rules are virtually ignored, motorcycles will weave around pedestrians. Cars, however, are another story, and you need to avoid crossing in front of one as they don’t stop for motorcycles, bicycle or people. The pavement condition in Vietnam is not great. We often have to venture onto the road to avoid construction waste or potholes. Again, cars are used to it, but be more careful at night. In fact, when we were in Hoi an – we ended up walking a good 40 minutes back to our homestay in the dark without any trouble at all. This is not only for complaining later but also for safety reason. We once got in a taxi that tried to charge us twice the price, only the threat of reporting him to tourist board did he stick to the meter. Don’t get on a taxi unless it’s metered – confirm it before you get on. It’s a legal requirement and any drivers that try to charge you more is definitely scamming your money. Unless you are asking them to stay around. Some drivers will try to take you around the long way, so make sure you show them your destination and a google map route. That way, he’ll have no excuse. If your driver is (pretending to be) lost, or don’t understand where you want to go, don’t hesitate to tell him to pull over. When in Danang, our driver somehow didn’t understand where the biggest market is and started going the wrong way. We told him to pull over, paid him, and got off. While language barrier is an issue, google map shouldn’t be. Since 2016, you can now use the app Grab to call a taxi and know how much to charge beforehand. It shows you the license number and photo of the driver and allows you to track the car real time, before and when you are in transfer. There is also Grab bike, which is cheaper and you will definitely get a helmet. For getting around, I had mostly booked tourist catered tour bus to get from one place to another. I had mostly booked through TNT in Hue for getting around Central Vietnam. Public long distance transports are virtually non-existence and the tourist bus do great hotel pick up and drop off service. When I haven’t been on one myself, I had seen a few and their techno coloured light coupled with the rocky road and crazy traffic means it’s not exactly “sleep-optimized”. I have also seen some coaches where people’s feet are right up someone else’s head, and that’s not okay. Having talked with some travellers, many agree that while it’s a cheap way to get around, you’ll be pretty dead the next day and that’d be a waste of time. A better alternative, the ideal situation could be to grab your friends and book a compartment. That way, you can lock it for safety. Keeping your belongings safe is an issue if you are sharing. If you happen to need to get somewhere at an unsociable hour, or simply willing to spend some dosh, you can book a private car. It’s fast and safe, but would definitely cost more. Despite many warnings from friends and family about safety in Vietnam, I found it to be perfectly safe aside from the traffic. Although I am not sure if my similar appearance to the locals had anything to do with that, but even walking around at night in Hue, Danang and Hoi An as two girls didn’t bring us any trouble. The only things to be wary of are scammy taxi drivers and bicycle tuk-tuk. Money scams are definitely more likely to occur. Whenever we order noodles of any kind, we are given a huge bowl of herbs, usually lemon basil, along with bean sprouts to go with. Hong Kong is a meat-loving place, so I end up leaving the bowl full more often than not. Lime halves are often given as well for you to add to taste, it’s actually really nice. Dirty ice is probably one of the most frequent causes of upset stomachs. So if you are already feeling off, avoid drinking anything with ice. Although I had stayed at some pretty nice places, we had a few cases of extreme encounters. A hotel we booked didn’t even have a showerhead or clean the room properly. I actually found ants on my bed on 2 occasions. 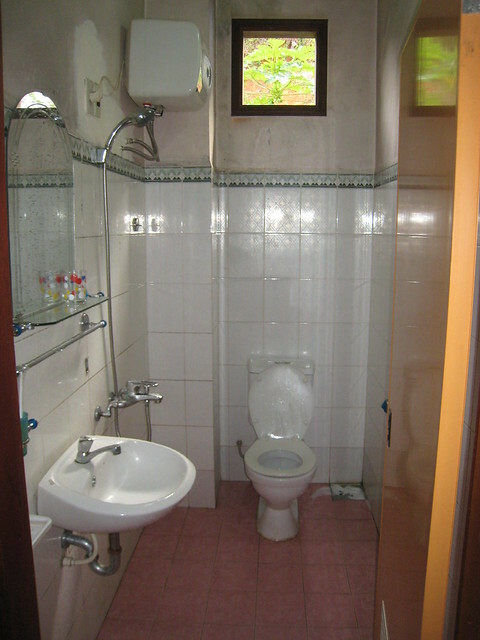 All of the hotels and homestays we have been to have an open plan shower, regardless of their price. It definitely takes some getting used to, and bringing a pair of flip flops is a must. Yup – it actually happened. The driver can’t understand where the biggest market in Danang is, or the google map direction that we keep giving him so we just told him to stop. It’s hard to imagine how a taxi driver wouldn’t know where the most famous market is in his city. Danang is wonderful if you are planning on going. They have a 31km long beach!